In 12-inch skillet, cook beef over medium- high heat 5 to 7 minutes, stirring occasionally, until thoroughly cooked; drain. Stir in salsa, tomato sauce and water. Heat to boiling. Stir in macaroni and corn. Reduce heat. 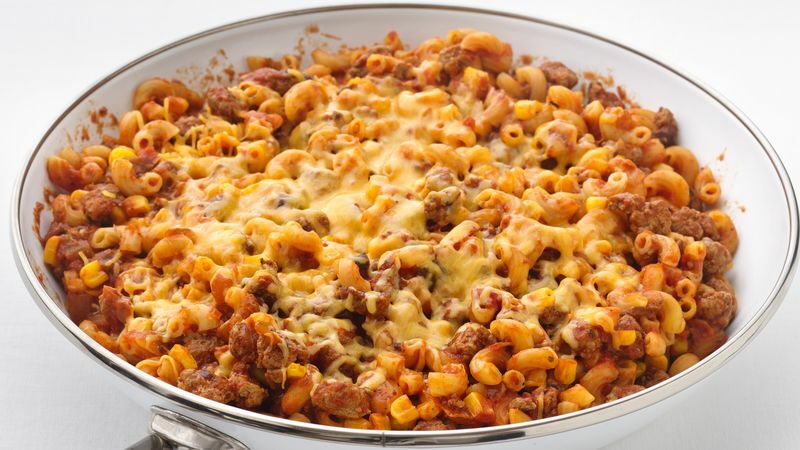 Cover; simmer 12 to 15 minutes, stirring occasionally, until macaroni is tender. Sprinkle with cheese. Remove from heat; let stand covered 1 to 2 minutes or until cheese is melted. Toss a crisp green salad with your favorite reduced-fat dressing and serve it with this family-style skillet meal. Fresh fruit makes a perfect dessert.